The Dixie Flyers were the first team to hit the ice when hockey first appeared in Nashville in 1962. They played as part of the Eastern Hockey League for nine whole seasons before the team ended in 1971. 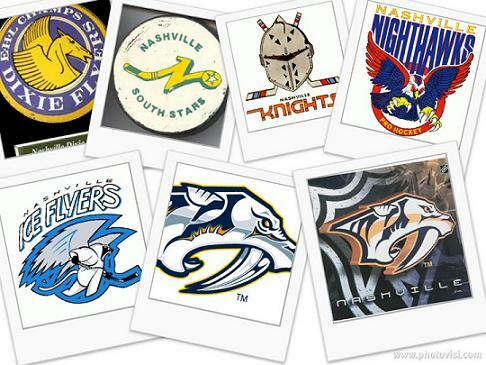 Ten years passed before Nashville got another taste of hockey in the form of the Nashville South Stars. The team was brought to town by Nashville Sounds owner, Larry Schmittou. While the team featured Bob Suter of the Miracle On Ice team and several Minnesota North Stars prospects, the team unfortunately folded after only two seasons (1981-1982 & 1982-1983). Once again, hockey came to Nashville in 1989. The Nashville Knights, playing in the East Coast Hockey League, were considered the most popular team to come to Nashville. The Knights were coached by Peter Horachek (the current assistant coach of the Nashville Predators). They hold an ECHL record after scoring 16 goals in one game during the 1994-1995 season. In 1996, the Knights moved to Florida and became the Pensacola Ice Pilots. As a final attempt at a minor league hockey franchise, Nashville introduced the Nashville Nighthawks in 1996 shortly after losing the Knights. During the 1997-1998 season, they changed their name to the Nashville Ice Flyers, but the team came to an end once the Predators were brought to Nashville later that year. Rumors swirled in 1995 that the New Jersey Devils would possibly be relocating to the arena that was being built in Nashville. The Devils attempted to terminate a lease they held with New Jersey after Nashville offered a $20-million dollar bonus to any team that would relocate, but the Devils decided to restructure and stay in New Jersey. Soon after the attempt to get the Devils relocated to Nashville, commissioner Gary Bettman released a statement noting that Nashville might at least be considered for a franchise in an upcoming NHL league expansion. In January of 1997, Craig Leipold requested an expansion franchise for Nashville from the NHL. Bettman, along with several league officials, came to Nashville and toured the arena where the team would play. Thousands of Nashville residents gathered around the arena and greeted them. The following June, a conditional franchise was granted to Nashville (along with conditional franchises going to Columbus, Atlanta, and Minneapolis-Saint Paul). Nashville would only be able to begin playing in the upcoming 1998-1999 season if they sold the NHL requirement of 12,000 season tickets before March 31, 1998. Nashville would also begin playing first because it was the only city with a completed arena. Nashville’s saber-toothed tiger logo was revealed on September 25, 1997, at a press conference held by Leipold and then-team president Jack Diller. The logo came about from an incident in 1971 when a partial saber-toothed tiger skeleton was found beneath downtown Nashville during the construction of the First American National Bank. A vote was held among fans as to what the team should be named. Out of 75 submissions, three were chosen: “Ice Tigers”, “Fury”, and “Attack”. Leipold decided to add his own submission to the mix. After holding another press conference to reveal the winner, Leipold informed fans that his submission had won out and the team would be known as the “Nashville Predators“. The Nashville Predators first game was on October 10, 1998, at home, against the Florida Panthers. They lost 1-0. On October 13, they recorded their first win after beating the Carolina Hurricanes 3-2.